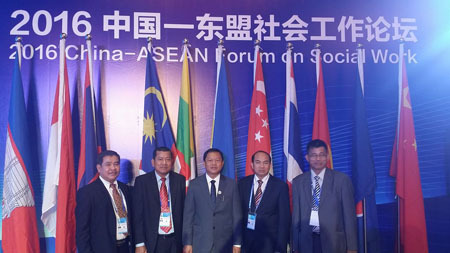 The DSW was asked to participate in the 1st China-ASEAN Social Work Forum hosted by the Ministry of Civil Affairs of the People's Republic of China and the People’s Government of Guangxi Zhuang Autonomous Region. Bora Chun, instructor and Dean Sovankiry Kim joined the meeting which provided another excellent opportunity for regional networking. 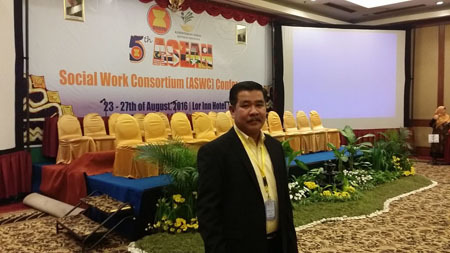 This year’s ASEAN SW Consortium meeting drew over 100 participants from 9 ASEAN members states to Indonesia. This group continues to provide an excellent opportunity for members to network, share information and to develop a common understanding of professional social work. 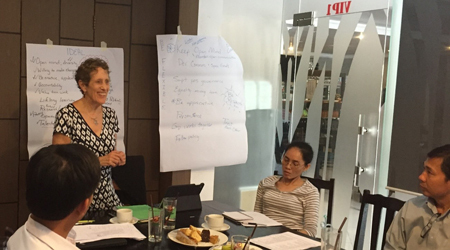 Instructor Samnang Chea attended this recent meeting and gathered new information about services in these sectors. She reports that she was particularly struck by the role of supervision to support on-going capacity development and would like to implement strategies that she learned from one of the presentations. She had an opportunity to learn more about the role of medical social work which is valuable for the Partnering for Health project. 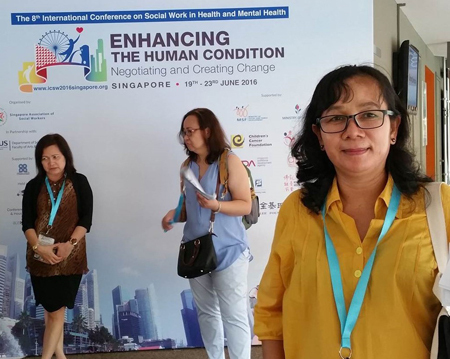 Instructor Phaneth Sok returned from attending the June Trauma Recover and Corporate Solution conference in Singapore and also visiting Singapore General Hospital and Changi General Hospital. The 6th annual TRACS conference included a pre-conference taught by UW faculty Dr. Debra Kaysen, Professor and Director of the Trauma Recovery Innovations Program dedicated to developing and testing more robust interventions for trauma-exposed populations. 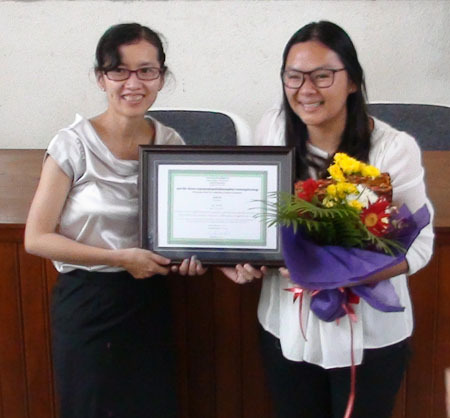 This year’s Sil Sineng’s Y3 Outstanding Supervisor went to Ms. Thareth Sok. She is staff at the Worker Information Center which seeks to improve working condition for garment workers. Network members including PFH team. 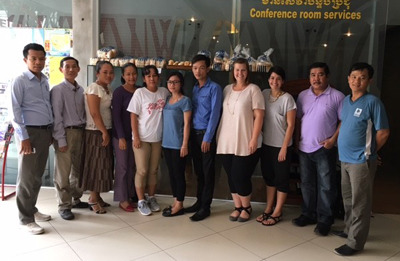 MSW student Erin Fitzgerald traveled to Phnom Penh spring quarter to work with the SW Unit at Calmette Hospital and explore their tracking process. This pilot project has now seen over 440 patients with a range of ailments from cancer, stroke, kidney disease, injury and trauma. Erin is the first recipient of a fellowship award from the Harachi-Yoffa Endowed Fund to support students and faculty interested to conduct research or independent study in Cambodia. Arriving in a foreign country, to a new culture, with no previous connections, I instantly felt I had a community within the Department of Social Work. It was a privilege to hear the stories of clients and colleagues to see how far reaching one person’s impact can be. Each DSW colleague is involved in so many different projects from teaching, direct practice, volunteering, policy reform, board membership, and advocacy. It was beautiful to see such varied interest and how quickly the field of social work is evolving in a developing Cambodia. I was humbled and inspired to bear witness to the magnitude of the work taking place. 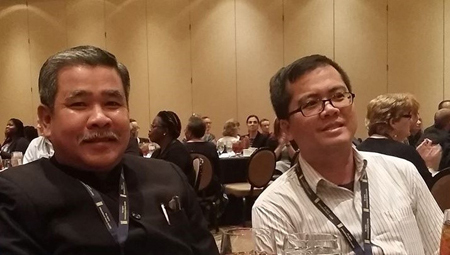 Instructors Bora Chun and Sambath Phal traveled in March to Dallas, TX to attended the BPD conference focused on the theme of “Promoting Excellence in Undergraduate Social Work through Education and Leadership”. It was an excellent opportunity to participate in pre-conference workshops and multiple sessions to learn more about teaching and administering baccalaureate programs, field education, and connecting classroom education to community practice. Both took full advantage of the opportunity to network and meet colleagues from other institutions. Sambath continued his journey to visit the University of Texas at Austin and meet with faculty and doctoral students in their School of Social Work. Both reported coming back energized with new ideas to share with their colleagues at RUPP. This marks Nancy’s 6th trip to share her expertise with the DSW team. The schedule was packed with meetings to discuss administration, courses, and an all faculty retreat to explore strategies to advocate for effective solutions within central administration and the university structure. 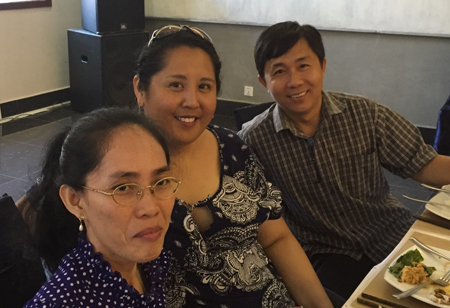 Thanks Nancy for her on-going support on-site and long distance! 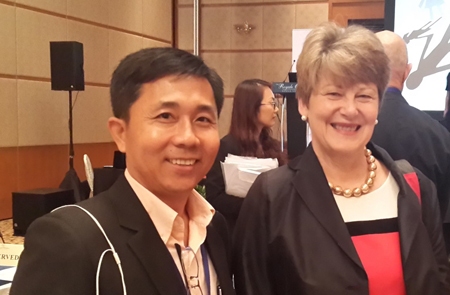 Instructor Lo Leang presented his paper “Children in Conflict with the Law, A Baseline Assessment, Cambodia” at the 10th annual conference of ISPCAN Asia Pacific Region in October.